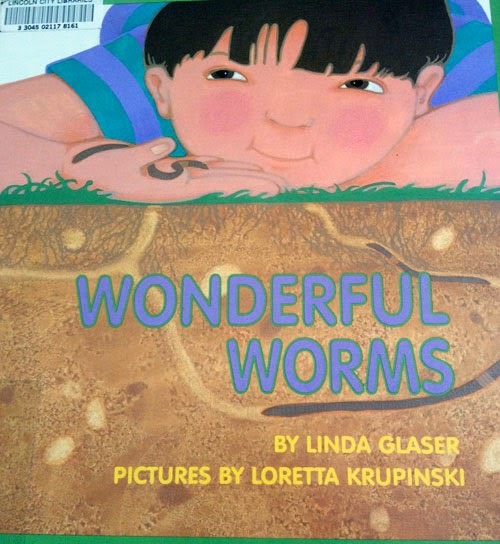 Of the two books I looked at this week that depict worms ("Diary of a Worm" is the other one. ), I prefer this one. Not only does it meet my criteria for showing levels and layers (both underground and above ground at the same time), it teaches a little about what worms do. It also has lots of illustrations of plants (roots, trees, leaves, grass, flowers, mushrooms, seeds, ferns) and animals/creatures (birds, worms, mice, people, snakes, chipmunk with acorns, toad on a rock, dog digging for a bone, mole catching a worm, lizard, snail, rabbit eating strawberries, butterfly). While reading the book, we'll be able to talk about the plants and animals and what they're doing, as well as observe patterns in the different leaves, snake scales, robin's feathers, mole's fur, etc. Look at all that action above and below ground! I'll definitely be presenting this book to all my mosaic kiddos. I really like the way it talks about the importance of worms in the garden and the illustrations are perfect for talking about layers and levels. There are so many creatures and different plants to look at discuss. There's also a page at the very end that gives "Facts About Wonderful Worms:"
Q: "Which animal is the most dangerous to earthworms?" A: "People who spray insecticides (bug-killer poisons) on the earth are the biggest danger to earthworms. that's because poisons can kill many acres of worms at one time. And there can be over a million earthworms in one acre of fertile land!"